The EPA investigation of a 1994 chemical plant tragedy concluded that "the explosion resulted from a lack of written safe operating procedures…" While good written procedures can't guarantee zero accidents, they can reduce the number of accidents caused by human error. This new book shows how to remedy this problem through selecting and implementing actions that promote safe, efficient operations and maintenance, improve quality, continuity, profitability and cost control, build upon and record process experience, and promote the concept that operating and maintenance procedures are vital plant components. It includes practical samples of procedure formats, checklists and many references. Chapter 1. Introduction to Effective Procedure Writing. 1.1. Why Was This Book Written? 1.3. The Current Worldwide Trend Toward Procedures. 1.4. Who Should Use This Book? 1.5. Where Do You Go From Here? Chapter 2. Process Safety Environmental, and Quality Considerations. 2.2. Understanding the Guidelines and Regulations. 2.6. Some Elements of Effective Procedures and Procedure. Chapter 3. How to Design An Operating and Maintenance Procedure Management System. 3.2. The Importance of Written Procedures. 3.3. Elements of a Comprehensive Procedure Management System. 3.4. Determining Procedure Management System Requirements. 3.5. Evaluating Your Current Practices. 3.7. Designing and Implementing Your Procedures Management System. 3.8. How to Determine Which Procedures to Write. 3.9. Implementing a Procedure Project. 3.11. Maintaining and Improving Your Procedure Management System. Chapter 4. 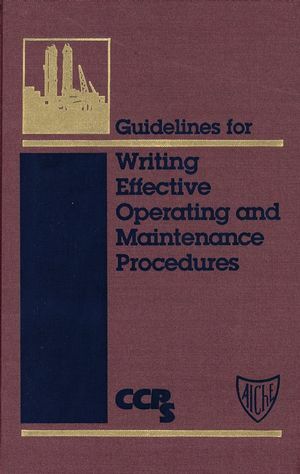 Writing Operating and Maintenance Procedures. 4.2. What Resources Do You Need Before You Begin Writing? 4.3. What Do We Know About the Procedure. 4.4. Considerations for Effective Procedures. 4.5. Importance of Procedure Format. 4.9. The Procedure Review and Approval Cycle. 4.10. Special Considerations for Maintenance Procedures. Chapter 5. Elements of Effective Procedures. 5.2. Importance of Procedure Evaluation Criteria. 5.3. Who Will Use the Procedure Evaluation Criteria? Chapter 6. Writing Emergency Operating Procedures. 6.2. Defining Events Requiring Emergency Operating Procedures. 6.4. Developing and Writing Emergency Operating Procedures. 6.5. Directing the User to the Correct Emergency Operating Procedure. 6.6. Incorporating Human Factors in Emergency Operating Procedures. 6.8. How Emergency Operating Procedures Link to the Emergency Response Plan. 7.2. What Is Procedure Control? 7.3. Controlling Procedure Revisions and Development. 7.4. Who Should Review the Procedures? 7.6. Evaluating Procedures In Use. Chapter 8. Procedure Development Costs and Benefits. 8.2. reasons for Procedure Development. 8.4. Return on Investment: Improvements You Can Expect from Effective Procedures. Appendix A. Selected Procedure Initiatives, Consensus Codes, and Regulations Affecting Procedures. Appendix B. Common Points of API, OSHA, and EPA. Appendix C. How to Determine the Tasks That Require Written Procedures. Appendix D. Procedure Performance Evaluation. Appendix E. Procedure Criteria Checklist. Appendix F. Sample Procedure Formats. Appendix G. Sample Formats of Operating Limits Tables.